The weekly spirituality and faith-focused Swedenborg and Life webcast will be celebrated with a live in-theater audience on Monday, May 9, 2016 at 8 p.m. ET. Members of the media and fans of the show are invited to attend in person while it’s broadcast live to the world on the offTheLeftEye YouTube channel. 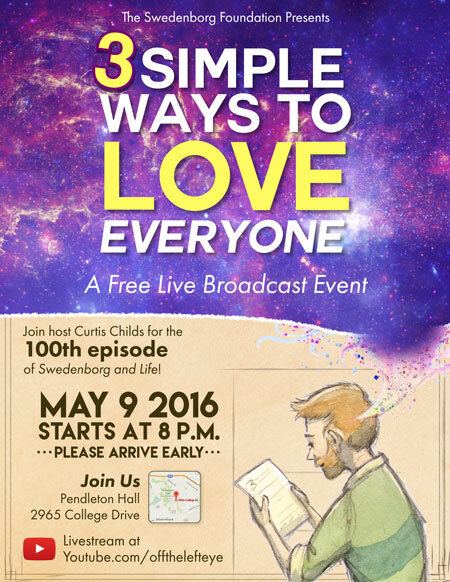 The 100th Swedenborg and Life episode, titled 3 Simple Ways to Love Everyone, will stream live to a worldwide YouTube audience while an in-person audience participates for the first time since the show’s inception in 2014. The episode will be filmed at Pendleton Hall on the campus of Bryn Athyn College, which is just north of Philadelphia. The event is free of charge and open to the public! Encapsulating one of the major themes of the series, the 100th episode will focus on ways to think and act with compassion, offering practical techniques and exercises for a love-centered approach to everyday interpersonal interactions. A question-and-answer session during the show will give audience members a chance to interact in real time with beloved producer and host Curtis Childs. Download this event flyer and share with your community and social media sites too! Click to view larger.